Nuweiba is known for nature, wildlife, and historic sites. Your plan includes some of its best attractions: discover the deep blue sea with a scuba or snorkeling tour, step off the mainland to explore Coral Island, don't miss a visit to Nawamis, and tour the pleasant surroundings at Duna Reef. To see reviews, maps, traveler tips, and more tourist information, you can read our Nuweiba journey builder website . Chennai, India to Nuweiba is an approximately 14-hour flight. The time zone changes from India Standard Time (IST) to Eastern European Time (EET), which is usually a -3 hour difference. Expect colder temperatures when traveling from Chennai in March; daily highs in Nuweiba reach 24°C and lows reach 9°C. On the 24th (Sun), wrap the sightseeing up by early afternoon so you can drive to Dahab. Spend the 25th (Mon) among aquatic life with a scuba or snorkeling tour. Spend the 27th (Wed) spotting exotic species with a safari tour. There's lots more to do: explore the fascinating underground world of Blue Hole, relax and rejuvenate at some of the best spas, get outside with Three Pools, and take in the exciting artwork at WICKEDiCANDY. To see photos, where to stay, other places to visit, and tourist information, read Dahab trip itinerary site . Getting from Nuweiba to Dahab by car takes about 1.5 hours. Other options: take a bus. Traveling from Nuweiba in March, things will get somewhat warmer in Dahab: highs are around 32°C and lows about 22°C. Finish up your sightseeing early on the 31st (Sun) so you can go by car to Sharm El Sheikh. Change things up with these side-trips from Sharm El Sheikh: Hurghada (Swim with Dolphins, Hurghada Marina, & more). Spend the 2nd (Tue) among aquatic life with a scuba or snorkeling tour. The adventure continues: buy something for everyone on your list at SOHO Square, pause for some serene contemplation at The Heavenly Cathedral, take in the spiritual surroundings of Coptic Orthodox Church, and head outdoors with Stingray's Club. To see where to stay, traveler tips, other places to visit, and tourist information, read Sharm El Sheikh holiday planner. You can drive from Dahab to Sharm El Sheikh in 1.5 hours. Another option is to take a bus. In March, daytime highs in Sharm El Sheikh are 32°C, while nighttime lows are 22°C. Wrap up your sightseeing on the 11th (Thu) early enough to travel to Cairo. 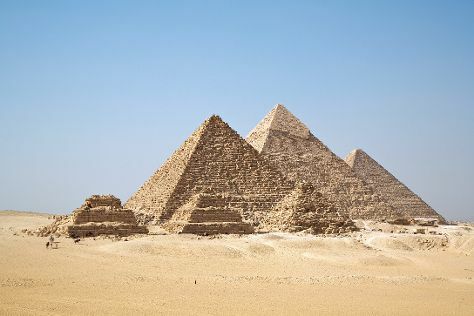 Start off your visit on the 12th (Fri): pause for some photo ops at Great Sphinx, delve into the distant past at Pyramids of Giza, and then contemplate the waterfront views at Nile River. Get ready for a full day of sightseeing on the 13th (Sat): shop like a local with Khan Al-Khalili and then delve into the distant past at Saqqara (Sakkara) Pyramids. To see ratings, other places to visit, maps, and more tourist information, read our Cairo route planner. Traveling by flight from Sharm El Sheikh to Cairo takes 2 hours. Alternatively, you can take a bus; or drive. Plan for a bit cooler nights when traveling from Sharm El Sheikh in April since evenings lows in Cairo dip to 19°C. Finish up your sightseeing early on the 13th (Sat) so you can travel to Luxor. Start off your visit on the 14th (Sun): delve into the distant past at Temple of Hatshepsut at Deir el Bahari, then explore the different monuments and memorials at Valley of the Kings, then explore the ancient world of Luxor Temple, and finally steep yourself in history at Temple of Karnak. Keep things going the next day: get engrossed in the history at Luxor Museum, don't miss a visit to Deir el-Shelwit Temple, then delve into the distant past at Medinet Habu, then delve into the distant past at Colossi of Memnon, and finally look for gifts at Bait El Ainy. 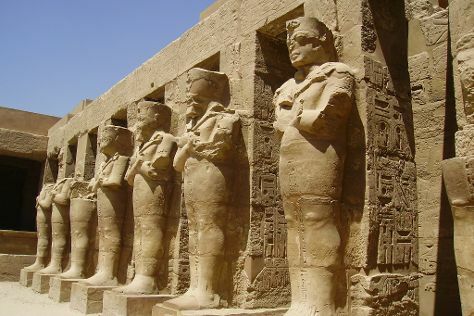 Discover how to plan a Luxor trip in just a few steps with Inspirock's itinerary builder. Getting from Cairo to Luxor by flight takes about 3 hours. Other options: drive; or take a bus. Traveling from Cairo in April, expect nights in Luxor to be about the same, around 21°C, while days are somewhat warmer, around 41°C. Finish your sightseeing early on the 15th (Mon) to allow enough time to travel to Praslin Island. Start off your visit on the 16th (Tue): explore the galleries of Galerie Passerose and then step off the mainland to explore Curieuse Island. On the 17th (Wed), you'll have a packed day of sightseeing: tour the pleasant surroundings at Anse Georgette, then admire all the interesting features of Pearl Farm de Praslin, and then admire the verdant scenery at Vallee de Mai Nature Reserve. For where to stay, traveler tips, other places to visit, and other tourist information, read our Praslin Island online route planner . Traveling by flight from Luxor to Praslin Island takes 13.5 hours. Alternatively, you can do a combination of taxi and flight; or do a combination of bus and flight. You'll lose 2 hours traveling from Luxor to Praslin Island due to the time zone difference. When traveling from Luxor in April, plan for slightly colder days in Praslin Island, with highs around 37°C, while nights are a bit warmer with lows around 30°C. Wrap up your sightseeing by early afternoon on the 18th (Thu) to allow enough time to travel back home.